Transatlantic Blonde‘s Feminist Friday linky is back and traveling. This Friday it will be hosted here at Circus Queen. If you’ve got a rant or an issue that you’re working through, get writing. 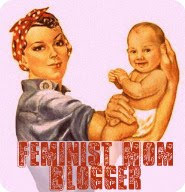 Bloggers, come link up your feminist posts. Non-bloggers, you can send your posts to adele@circusqueen.com by 7pm tomorrow night (Thursday 24th May) and I’ll publish them here for you. No theme but feminism. Looking forward to being inspired! Previous Post Breastfeeding a three-year-old: what’s the big deal?